The agriculture, forestry and fishery pilots in the project involve cross-domain activities with geospatial and earth observation sectors. 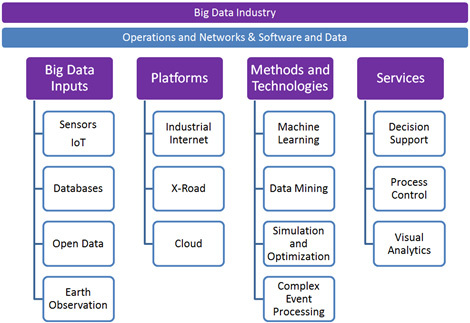 Key Big Data technological components are summarized in the below diagram. The heterogeneity is an important focus point in the project. 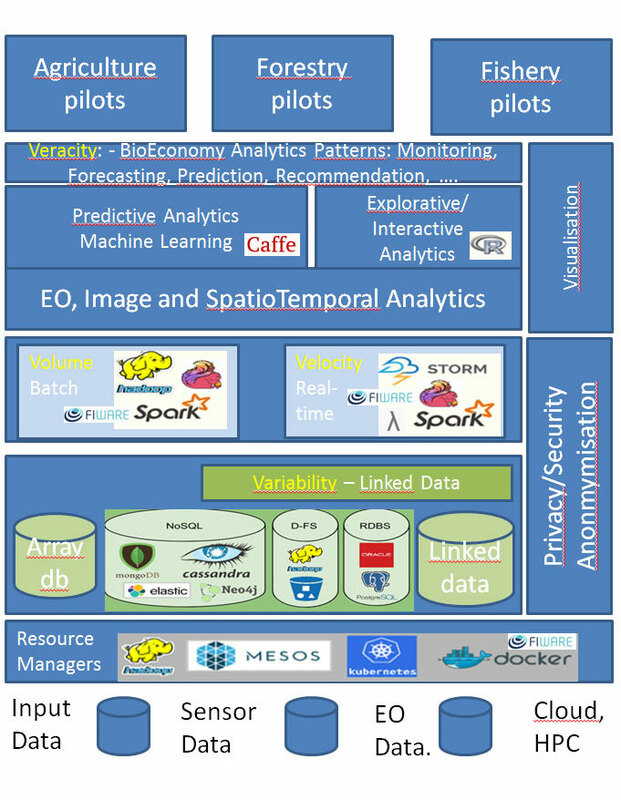 The work of ICT, Big Data (BD) and Earth Observation (EO) experts provide the enabling technologies to support Big Data Variety / Big Data Variability. In addition DataBio will support BD Velocity and Volume. The overall methodology of the DATABIO project is to build and pilot a big data technology platform, based on existing technologies and data sets, in collaboration with the end users and proceed to verify the concept through several pilotings in the chosen sectors. The project starts with a review of end users requirements and user understanding in co-innovative process for development, adaptation, customization and integration of a set of interfaces, platforms, tools and services utilizing existing technologies or very near-to-market technologies and piloting and validation of the concepts and services. It is therefore crucial for the successful outcome of the project that a clear and well-structured methodology is used in the project. To guarantee user involvement and user/stakeholder understanding participatory design and co-creative conceptualisingand prototyping methods are used (e.g. workshops, interviews, questionnaires, Owela online platform for co-innovation http://owela.fi in the beginning of the project in the co-innovative preparation tasks and during the duration of the project in each pilot sector Agriculture, Forestry and Fishery. The methodology for the analysis of the requirements will include a comparison of the requirements of different sectors Agriculture, Forestry and Fishery to establish the singular requirements of common Big DATABIO platform. The different big data solutions and data sets will very different from the user perspective in different bioeconomy sectors but common enablers the big data components will be utilized behind the user interfaces of the Big DATABIO platform. Other activities to be carried out during the co-innovative preparation will be the review and analysis of the legal and regulative issues on national and European level and requirements of other stakeholders. After the concept definition phase is finalized, the technical requirements and the final system architecture of the platform will be defined and integration of enabling technologies starts. The sectorial pilot implementations and piloting are continuously supported and validated by the experts of big data and earth observation who bring their enabling methods, tools and technologies to implementations. Pilots will run during each project year: pilots utilizing market ready big data and EO technologies will start already during the first year of the project and new features and almost market ready technologies will be integrated and piloted during the second and third year. Also the maturation level of the Big DATABIO platform will evolve during the pilots. The pilots will have different activity periods also because of environmental requirements like the weather conditions and also the seasons (spring, summer, autumn, winter) schedule a lot the work and raw material production in agriculture, forestry and fishery. Integrating the constituent parts of the multivendor systems to common Big DATABIO Platform and to sectorial services in a logical, cost-effective way, comprehensively checking service execution (all nominal & exceptional paths), and including a full functional check-out. And due to the large number of actors, wide scope and complexity of the system, a Continuous Integration model will be adopted rather than a Big Bang Integration model.